I’m sticking up for a film that The Force couldn’t quite save a few years ago. I’ve been on a Star Wars kick lately; I watched the Original Trilogy over 24 hours surrounding New Year’s Day and since then have been delving into vintage documentaries from the ‘70s and early ‘80s that spotlight the zeitgeist surrounding those original films. Over the years I’ve watched a lot of Star Wars-related content, mostly with mixed-to-poor results. 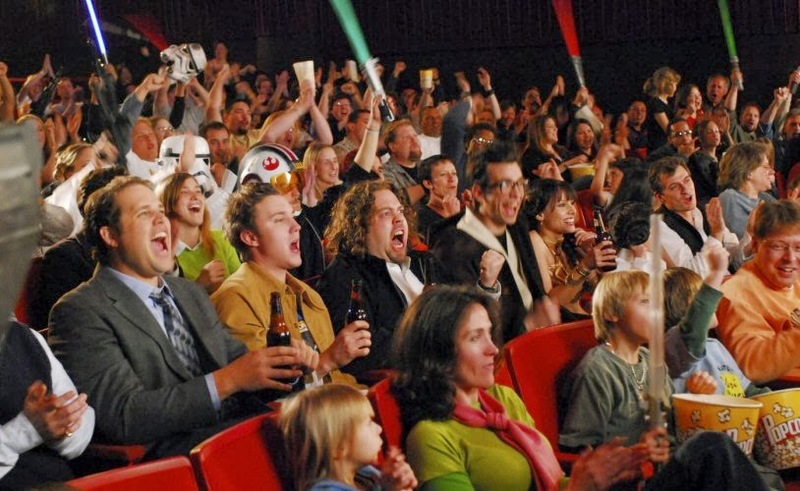 There are several documentaries on Netflix about Star Wars “fandom,” but I find most of them to be mean-spirited and/or incredibly obnoxious. At this point, I’m not interested in a two hour take-down on George Lucas and the missteps of the Prequel Trilogy. That’s old news, and I’d rather find content with entertainment value that doesn’t use phrases like “raped my childhood.” I still love Star Wars in spite of its flaws, and would prefer to celebrate the positive side of fandom and look back with affection instead of disdain. After all, part of why I love it so much is for the nostalgia factor; it was such a huge part of my youth. It’s not perfect, but nothing is. It’s been during this recent quest to consume more Star Wars-related content that I’ve really come to reevaluate my initial feelings of the film Fanboys, a four million dollar independently-produced film directed by Kyle Newman and written by Newman and Ernest Cline (who has recently found renown with his novel Ready Player One). Fanboys is a movie that I didn’t think too much of when I saw it a few years ago, but that I now consider to be one of those ambitious failures that we champion around here. It was also the victim of an incredibly screwed up production history due to interference and meddling from the studio, although this story has a happier ending than Knights of Badassdom. 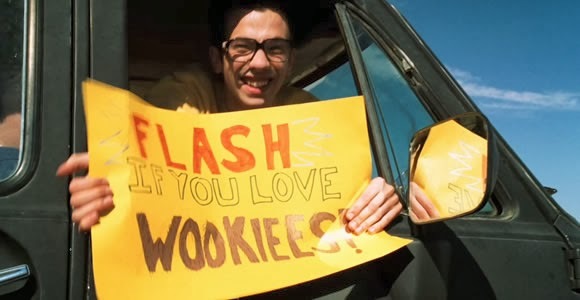 In case you aren’t familiar with the movie, Fanboys is a road trip comedy about a group of friends and die-hard Star Wars fans in 1998, a year before the release of Episode I: The Phantom Menace. The film, as scripted, centers around one member of the group being diagnosed with cancer and given a grim prognosis. What he wants more than anything is to see the new Star Wars film and have one more good time with his friends before the inevitable occurs. 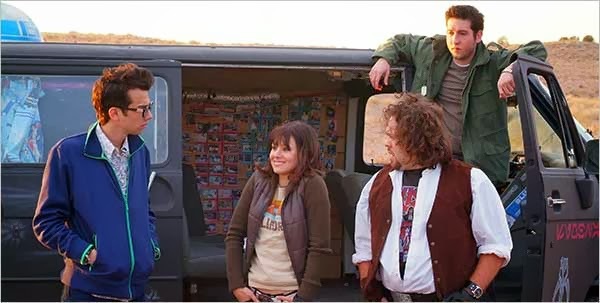 What follows is a very sweet, very silly adventure full of sentimental affection for the Original Trilogy as these friends decide to drive across the country and sneak into Skywalker Ranch, where they hope they’ll be able to view a print of the film. The core cast consists of Jay Baruchel, Dan Fogler, Sam Huntington, Chris Marquette, and Kristen Bell, who was just coming off her last season of Veronica Mars. There are also a TON of cameos, with somewhere around a dozen recognizable (and sometimes very surprising) faces showing up. Seth Rogen plays three roles. There’s a scene with Danny Trejo and an Ewok that might be my favorite of the whole film. The most impressive and surprising aspect of Fanboys is that it was made with the cooperation of Lucasfilm. The film finished principal photography in 2007 and a cut was shown to George Lucas himself, who liked the film so much that he gave the director Kyle Newman extensive access to the Lucasfilm sound effects library and even allowed them to film pickup shots at Skywalker Ranch, a near unheard-of honor. My understanding is that this boon prompted investors to give the filmmakers a little more money and allow them to go back and reshoot some things that had either been cut or weren’t working. But this is where things start to get ugly. The Weinstein Company hired a director named Steve Brill for reshoots to make the film more mainstream, requesting scenes similar to those that were successful in other films. Brill quickly took over the creative control of the project. We have Brill to thank for such cinematic masterpieces as the Adam Sandler vehicles Little Nicky and Mr. Deeds, as well as the Owen Wilson comedy Drillbit Taylor. Brill and Harvey Weinstein decided that the cancer plot didn’t work for the film at all and was only going to bring people down. A new cut was produced in which the group of friends (apparently) drunkenly set out for Skywalker Ranch because they just couldn’t wait for the film to hit theaters. This change drastically shifts the tone. I’m not crazy about comedies featuring cancer, but I’m even less crazy about film and comic book fans being portrayed as out of control losers who have no grasp on reality, or, you know…the law. Admittedly, some of the e-mails that were sent to Brill were pretty aggressive, but not all. Some were very polite and earnest, laying out why they felt the way they did and imploring him to reconsider chopping up the original intent of the film. All e-mails seem to have been responded to by Brill with the same vitriol. The campaign seemed to have some effect, though, because the re-editing was eventually abandoned by the Wenstein Company. Kyle Newman says he was told to sign a paper stating that he could re-edit the film to his vision, but only if he could do it in less than 36 hours. The end result was a film that exists in a sort of limbo: it’s not the director’s full vision because he only had 36 hours to cut it together. It’s not the studio’s vision either. The studio shenanigans didn’t end there. The film, shot and prepped during 2007, didn’t see the light of day until 2009. Even then, it was given a very limited run with almost no studio support or advertising. First opening in eight markets, then ten more a few weeks later, it was nearly impossible to see Fanboys for most of the country. I don’t believe it ever showed where I live, nor in many other cities across America. When it was released to the home video market, it was on DVD only. A year later, in 2010, it was FINALLY given a Blu-ray release. So after all that fuss, the question becomes “Is the final film worth all that trouble?” Given all the studio interference, it’s hard to say. A year or two ago I would have said no. There’s a lot that I like about Fanboys, but there’s just as much that I don’t like. There’s a mean-spirited Star Wars versus Star Trek subplot that I don’t think works at all. This is not 1982. There is absolutely no reason for anyone to feel like they can’t be big fans of both of those franchises, and the scenario that the movie presents feels dated or outright artificial. Furthermore, it portrays Star Trek fans as guys with taped up glasses and pocket protectors. Even before J.J. Abrams breathed new life into the Trek universe, such a stereotype was not based in reality. But in the world of Star Wars-themed entertainment, Fanboys is pretty unique. I’ve really come to view it as a film that takes some chances and tries to do something with some consequence and emotional heft. Enough works for me to want to champion it, and it stands surprisingly tall (dare I say ALONE) in the world of films that use Star Wars as a jumping off point for a coming-of-age story. I can’t really think of another film quite like this one, and I think that AT TIMES it does a really good job of representing Star Wars fandom. The film is at its best when it’s working without irony and snark. There’s an innocence and a sweetness to Star Wars, and that’s one of the reasons those of us who love it care as much about it was we do, so it only makes sense that Fanboys works best when it’s tapping the same vein. Still, it’s hard to fault anyone for the snark, because there were so many cooks in the kitchen that it’s near impossible to ascertain what comes from the original script and what was added for mass appeal. Critics didn’t like Fanboys. Roger Ebert said that it took its main characters too seriously and needed to poke more fun at them, but I disagree with Ebert’s assessment and am thankful that the film didn’t try to make bigger fools of the characters than Brill wanted to. As it stands, I think there’s too much “nerd-humor” already. “That Trekkie and that Jedi guy are fighting each other like Kirk and Spock in that episode ‘Amok Time!’” Ha ha! Oh, my sides! References for the sake of references aren’t clever or funny; they just remind me I’d rather be watching that thing you just reminded me of. I will add, though, that there is clearly a love of Star Trek on display here as well. You can’t write this (or have some of the cameos that they do) when you don’t have a deep love of both franchises. But for the most part, Fanboys steers clear of these pitfalls. There’s a lot of sweetness here, and it’s really about a group of friends spending time together while they still can before they lose someone. All the Star Wars stuff is just background noise to the human drama that plays out in the foreground. I really think Newman knew what he was doing, and it’s a shame that his film got buried. I’ve become so tired of the cynical cycle in which I find most of our comedies these last few years (thanks, Hangover), and I just want to see real people in real situations being funny and maybe even learning something. Though it’s sometimes silly and clichéd, Fanboys does that, and I’ve come to it with fresh eyes and a new appreciation. If you haven’t seen it and you’re looking for something fun to fill the void that other Star Wars-related projects might not fill, you may want to take Fanboys for a spin around the galaxy. It’s far from perfect, but The Force is stronger in this one than I once thought. Very interesting read...always impressed how you guys at FTM are so well versed on context and history of the movies you discuss and the industry as a whole. Great job, Heath. Articles like this give me "new hope" (get it?) that sincerity is winning the war against irony. I mean, sincerity has to win at some point, right? Because if things keep speeding into irony, what's going to be left of us? I think it's turning around, but slowly. Either that, or WE'RE ALL DOOMED. I love Fanboys. I saw it twice in the theaters. I can't defend it as being a "good" movie in the traditional sense but I think it is pretty fun and very entertaining. I even like Dan Fogler in it. Plus it's vintage Baruchel. Great article Heath. I had no idea about that Steve Brill stuff. What an a**hole. Right? That's kind of where I come down on the movie too. You can't defend it as "good," like you say, but you can certainly see that it's different and that it really tries to do some things differently, and it's actually got a lot of sincerity, which make you want to champion it. Kyle Newman did an interview for /Filmcast around the time of the DVD release. It's an very interesting and honest discussion in which Newman is allowed to be less diplomatic about his feelings about the changes that Weinstein and Brill made to the movie. He says a lot of stuff about the post-production he probably wasn't allowed to say on the commentary track. Nice to see some love for Fanboys. The movie isn't perfect by any stretch but I like it a lot if not just for the inside Star Wars jokes but also that it's heart is so in the right place. I actually had the pleasure of seeing this one in theatres myself with a small yet appreciative audience and had a great time. I really wish more movies like this would come out that go into a geek culture and really have fun with it. The only other movie that comes to mind for me is the underrated Role Models which really got into the LAARP group and had fun with them but didn't overly make fun of them. 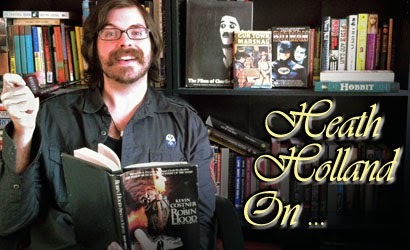 Great article Heath - I like Fanboys a lot - I didn't realize it had such a sordid history. I think the slightly more serious cancel angle would have made for an even more interesting movie - at the time, at least - terminal illnesses have been done to death (har har) in comedies now. I liked 50/50 and Funny People but that's enough of that for awhile. Actually I think you can defend this film as being "good" - and part of that good is most definitely the cancer story arch of Linus. How could Weinstein become so successful when he so missed this boat? What's really rotten is the sabotage by him to ensure the film WASN'T successful. Extreme sour grapes. It's shocking that a shlock like Brill behaved in such a juvenile, bullying fashion to fans who sincerely tried to plea the case of leaving the director's original intent alone. Just watched it again - 6/10/14 - and I like it even more. I wish good fortune for Kyle Newman and any future productions - just looked him up on IMDB and it appears he just finished a new film. Will see this new film because of his work o FANBOYS. And hurray for Kevin Spacey!